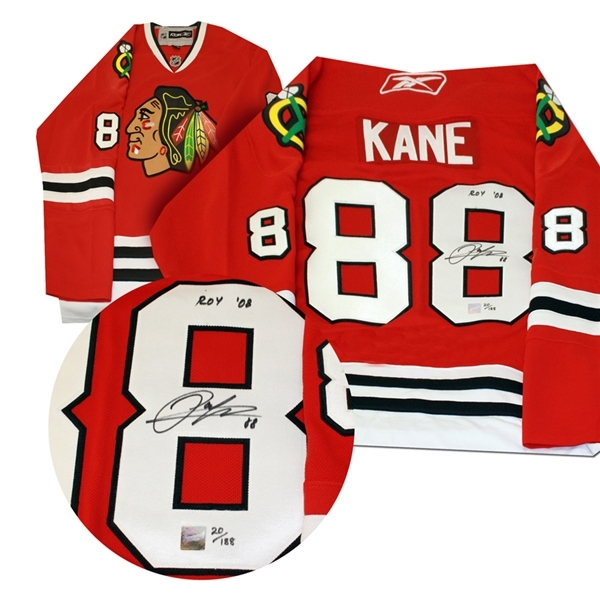 Lot Detail - Patrick Kane Signed Jersey Blackhawks Red Replica Reebok Inscr "ROY 08"
Patrick Kane Signed Jersey Blackhawks Red Replica Reebok Inscr "ROY 08"
This jersey comes personally signed by sniper, Patrick Kane. This jersey comes with the inscription “ROY 08”. Kane is known around the NHL as one of the most lethal snipers in the game, with a quick accurate shot that can be taken from anywhere on the ice. Kane has never played a season with less than 21 goals since joining the NHL in 2007. After getting off to a great start in the NHL, Kane won the Calder Memorial trophy in 2008 with 21 goals and 72 points. Kane has taken home three Stanley Cups with Chicago, his best being in 2013 when he earned the Conn Smythe Trophy, where he scored 9 goals with 10 assists. In 2016, Kane finished a career year with personal best in goals (46), assists (60), and points (106), Earning him the Art Ross, Hart, and Ted Lindsay Awards. In 2019, Kane will have played in his fifth consecutive All-Star game and eight of his career. This NHL & NHLPA officially licensed product comes with a Frameworth Hologram and Certificate of Authenticity. Frameworth is the exclusive autograph provider for Patrick Kane. We do not guarantee any specific jersey sizes but we typically carry sizes L, XL or 52, 54 & 56 for Pro jerseys. These sizes are considered the most ideal for framing & displaying.